Please arrive at the Maitland Town Hall from 6 pm - entry via the front door only. Hors d'oeuvres will be served at 6:30 pm and the Grand March will commence at 7 pm. There will be a combined savoury and sweet supper at around 9 pm. Hot and cold drinks will be available for most of the evening with water available throughout. 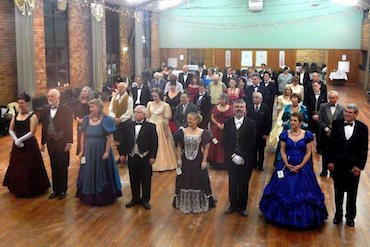 A Colonial-style Subscription Ball held each year at Maitland Town Hall, a venue boasting one of the best sprung dance floors in the country. 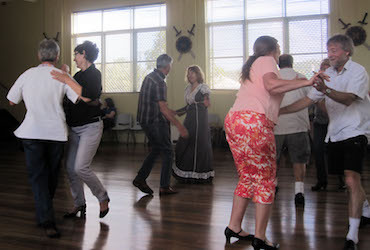 The ball is a dancer’s delight with the dance programme selected from diverse styles of dances, including Colonial, Traditional, Celtic, Regency, European and Bush. Preferred dress is formal and in keeping with Australia's Colonial period. 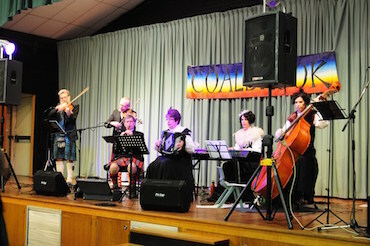 Music provided by Coalbrook Band. Held on Sunday, 28th August from 11 am at Marmong Park, George St, Marmong Point, the BBQ/picnic is a time to recover, relax and socialise, with the opportunity for more dancing if desired. The park contains the Marmong Point Community Hall for dancing and shelter from the weather (if required). There is a large grassy area with shade trees and a view of Lake Macquarie. You can partake of the BBQ lunch provided (pre-booked and prepaid) or BYO. Please BYO chairs and drinks. Wells St and Henry Parry Dr. East Gosford. Wallsend (near intersection with Cowper St). Contact Wendy - Ph 0412 145 262. All practice sessions cost $8 for the day. Tea, coffee and cold drinks provided. There will also be practice nights at the Pennant Hills Dance Workshop. ****Prices from 15th to 21st August – Add $5 to each ticket price. For catering purposes all Ball tickets must be pre-booked, payments made and details confirmed via the booking form or via email by 21st August. BBQ / Picnic (catered) $10Booking and payments for the BBQ/picnic must be received by 21st August. You can attend this event and fully cater for yourself for free if you wish.